... wonderful views over The River Tweed. See the sun rise over The Tweed Valley. 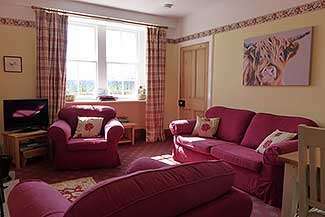 A warm welcome to Hendersyde Farm Self-Catering Holiday Homes, near Kelso, in The Scottish Borders. 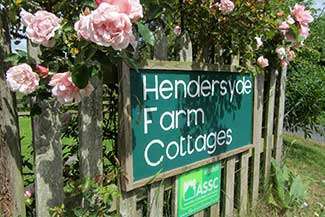 If you are looking for a blissfully peaceful spot for a self-catering holiday in The Scottish Border countryside, Hendersyde Holiday Cottages might just be the place for you! The cottage porch leads to the well equipped, west facing kitchen, with table & chairs, it catches the evening sun. 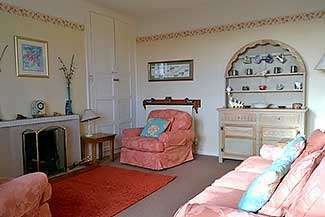 The south facing sitting room, has a cosy open fire. The dinky downstairs bath room has a power shower over the bath. Upstairs are a double and twin bedroom. Central heating throughout. Wi-Fi. is included. The enclosed cottage garden views stretch to Northumberland! Couple’s Discount on all bookings. Southsyde snuggles in the centre, the same, yet slightly different! From the porch, the kitchen leads into the hall, garden, sitting room & downstairs bath room. Upstairs are two double, or twin bed rooms, with views north and south. Open fire, central heating and Wi-Fi. There is a couple’s discount on all bookings, in all the cottages. Hang your coats in the porch, step into the freshly fitted kitchen. Curl up with a book in the comfy sitting room – the shelves are stacked! The downstairs bath room has a power shower over the bath. Upstairs the double and twin bed room have original floor boards, with sheepskin rugs. Enjoy the garden and seasonal fruit!